Just completed a big canvas order for a commercial client. 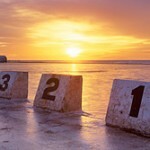 This was one of the images, a sunrise shot of Dee Why that was converted to black and white and we then split it up into three equal sections to print off and stretch as a triptych. When all the panels are together you see the full image, nothing is lost on the sides, this process is called “Mirror Wrap”. This canvas is a 60 x 20 inch, so each panel is 20 x 20 inch. The whole job was completed by us. We are now able to fully handle all of our own canvas jobs from start to finish. 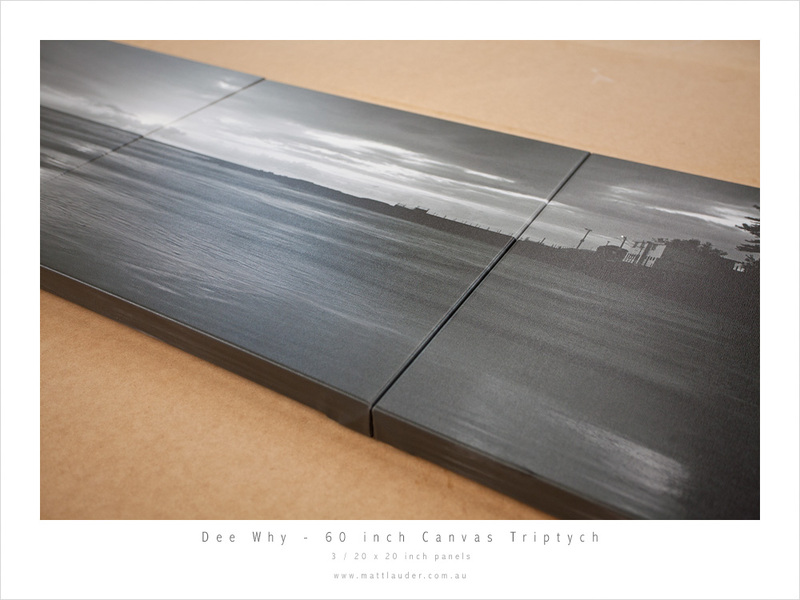 This entry was posted in Archives and tagged canvas printing, canvas stretching, central coast, matt lauder, matt lauder photography, mirror wrap. Bookmark the permalink. Thanks Mitch… yea I liked the colour one as well. The customer wanted the black and white… still came up a treat though. Nice Matt, stretching these puppies aren’t that easy looks like you have it mastered!